Home / Freebies / Free Stuff Online / Free Bonus Star for Starbucks Rewards Members! Free Bonus Star for Starbucks Rewards Members! Hey Starbucks Rewards Members, you can get a FREE Bonus Star Today! This may not work for everyone, but it is worth a try! Also, check out all of the current Starbucks Coupons that are available for you today. 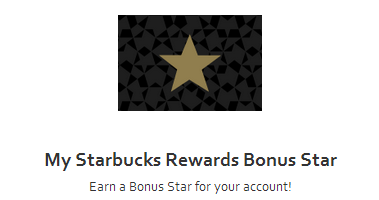 To get the FREE Star, just sign in to your Starbucks Rewards account and scroll to the bottom and look for the image you see above and click on it. It will ask you to download the financials for 2013 and if you just click and close out the PDF you will see a message that says “Task Complete” and the star will appear in your account in up to 24 hours!